Car games are a genre of arcade games that when done right, are absolutely brilliant. 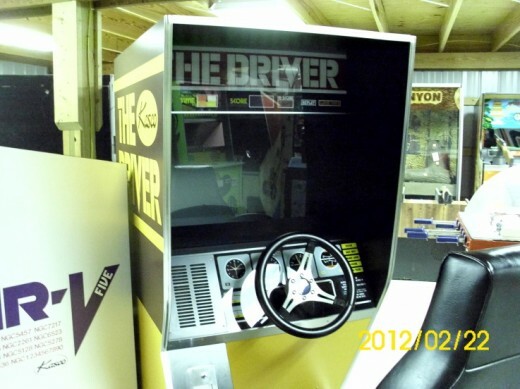 From the early days of the 1970s with the likes of 'The Driver' from Kasco (which is the first driving arcade game I can remember) right through to the modern day, driving games have carved out a unique niche for themselves. Here I will look at a selection of car games that have moved the gaming experience to the next level and have also left an indelible mark on the gaming scene. Car Games really came to the fore during the 1970s and the quality levels increased dramatically through the 1980s and 1990s. The lights are set, the engines are running, the grid is packed full. The Driver is memorable for using 'real film' to simulate the chase and was cleverly advertised as 'motion picture driving'. The object of the game was for you the player to pursue another driver around various roadways and tracks, all of which were filled with numerous hazards. The real trick to the game was matching your steering, braking and accelerating to what was happening on screen, sort of 'keeping in time' with the film. This would ensure that you would keep in touch with the car in front of you; if you let it push too far ahead it was game over. No matter how good you were you could never quite catch up with though! In fact, the way this game was created (and played by viewing pre-filmed footage of dangerous driving situations) makes it an early relative of those Laser Disc games that came to the fore in the 1980s. 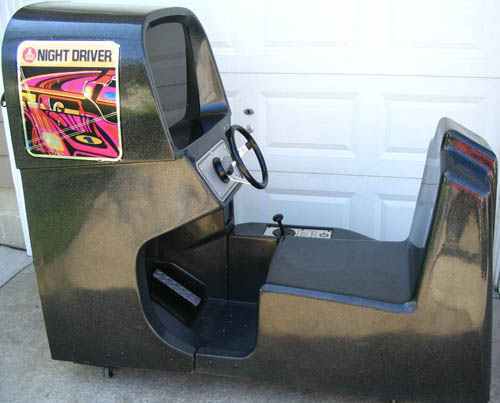 Night Driver was released by Atari in 1976 and is regarded as one of the earliest first person driving games. This game, along with the German driving game 'Nurburgring' is (most likely) the first arcade game to display real-time first-person graphics. 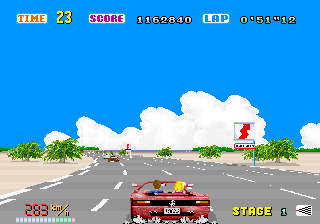 The player was placed behind the wheel of a car which had to be navigated along a road during nighttime without leaving the tarmac as indicated by roadside markings. At the beginning of the game there were three tracks to choose from with varying degrees of difficulty. The car the player controlled was not actually drawn by the game. 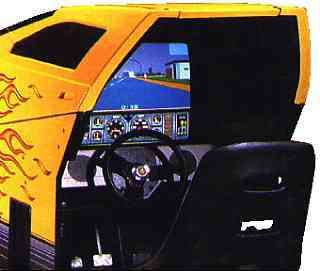 Due to the limited video game technology of the era, the car was a printed plastic insert positioned behind the game screen. The game was also titled 'night driver' as it easier for the hardware (and coders!) to draw the environment with minimalist graphics as most things such as paths, buildings, trees and so on did not need to be drawn, as they were 'hidden' in complete darkness. Pretty cunning really! There were two versions of the cabinet manufactured, an upright cabinet and a sit-down cockpit. The sit down version was of course, the best to play. 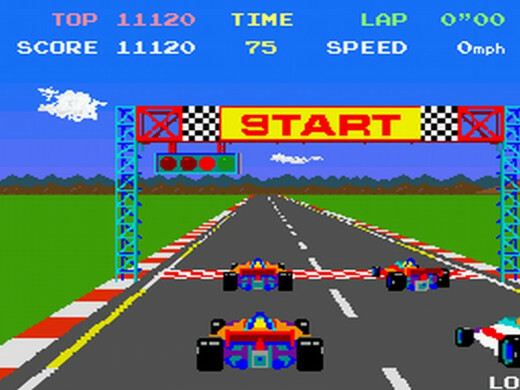 Pole Position by Namco is one of the most important arcade racing games of all time. Released in 1982 it pushed the genre of car games and racing games to the next level. With it's colourful, smooth and fast moving progressive sprites, pseudo 3D vanishing horizon and digitised speech it is an undoubted classic game in the racing genre. As you dropped your ten pence coin into the slot and those famous words "Prepare To Qualify!" rang out, the excitement would build as you waited to race in the qualifying lap and play it fast enough to get into the game proper. This is a truly iconic racing game and for me is a real classic arcade example from the 1980s. 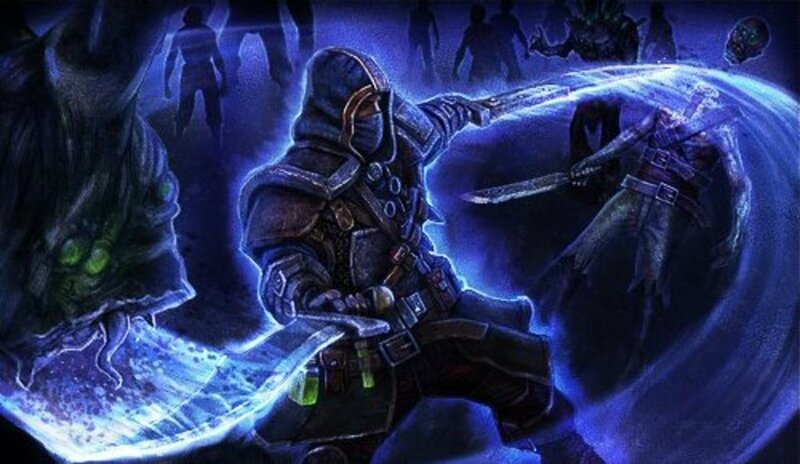 I have created a separate hub dedicated to this game. To see an in-depth analysis please take a look at my Pole Position Arcade Game hub. 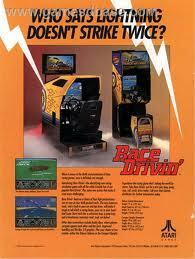 Which is your favourite arcade driving game? 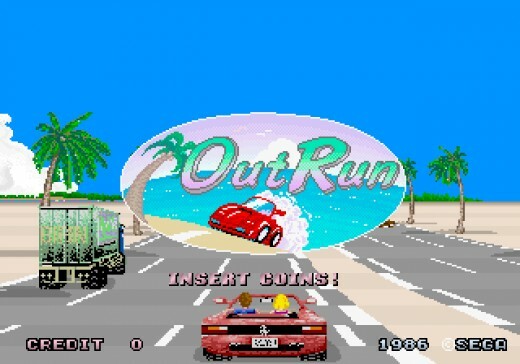 Out Run is one of the most famous driving games of all time. Designed by the legendary Yu Suzuki it was released by gaming giants SEGA in 1986 to much critical Acclaim. The graphics were absolutely top drawer, the in game music was superb and the feeling of speed and motion was nothing short of thrilling. It was as close to driving a real Ferrari that any of us would get! Neat little touches like being able to choose your music at the start of the game via the in-car sterio system made Out Run an instant classic in the driving genre. The game was also not completely linear; at the end of the first section you could choose to take the left or right fork in the road. This choice continued at the end of each section; there were always two different routes to take meaning the overall route was comprised of different race branches. With five full 'sections' to drive through before completion it meant that there were many possible routes to take to reach the 'end' of the game. This added a lot of variety to the game and accomplished players would return to try out different routes as the scenery for each race section was always different to the last. 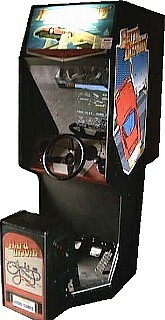 Hard Drivin' was an arcade driving game that allowed players to drive performance sports cars around speed and stunt courses. 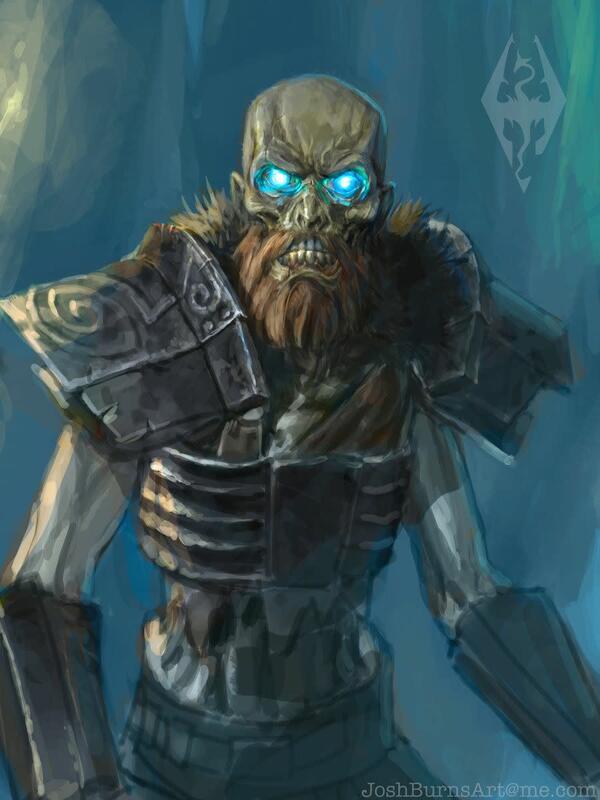 The game was one of the first of its kind to feature an environment constructed via solid 3D polygon rendering. It is also notable due to the use of force feedback and realistic physics to simulate the actual movement of the car being driven. 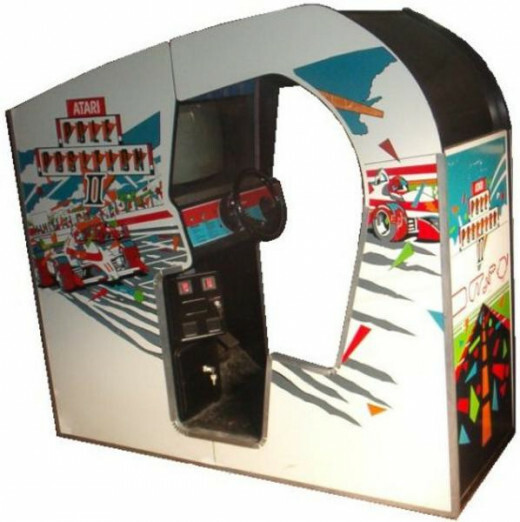 In 1989 most arcade racing games were still creating the racing environments with scaled sprites to created the 3D effect (such as Out Run and Pole Position) making this game with it's use of three dimensional solid polygons yet another move forward in the driving genre. With it's fast moving graphics, realistic (if difficult) handling (including the use of a clutch when changing gears on a manual car) and 'action replay' feature this is a game that became a real draw at the end of the 1980s. 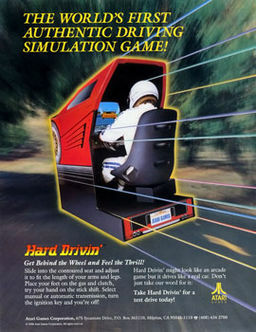 Hard Drivin' was so popular it was converted to many home computers such as the ZX Spectrum, Amstrad CPC, Commodore 64, Atari ST and Commodore Amiga. The ZX Spectrum version ended up being quite playable which was a minor miracle given the huge gulf in technology between the 8-bit machine and the arcade hardware. The follow up to the immensely popular Hard Drivin' was released a year later in 1990. 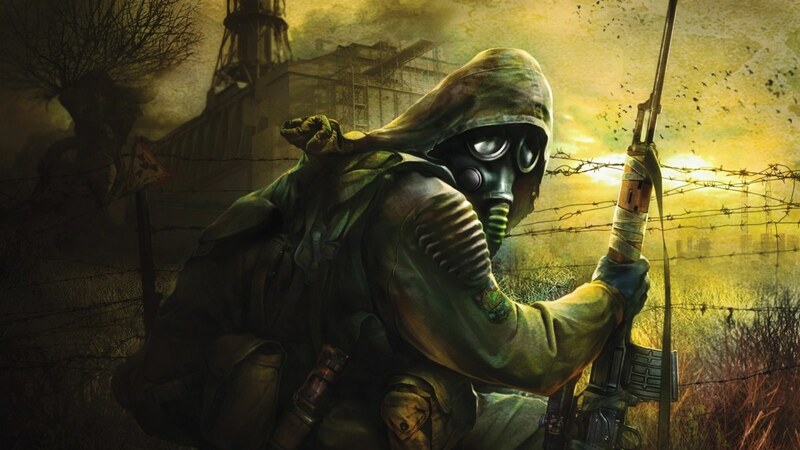 The game was very similar in style to it's predecessor in terms of visuals, sounds and gameplay. The game pushed the envelope of the previous title by making the tracks more outrageous and emphasised stunt-work and outright speed. There were also options to take part in a buddy race and there were cabinets that were linked together allowing friends to race against each other which was tremendous fun. Having a selection of cars to choose from at the start of the game made this game a brilliant sequel to an already brilliant game. 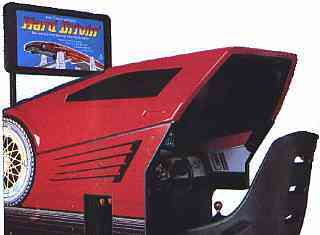 Race Drivin' was yet another huge hit for Namco and ended up being converted to the Commodore Amiga which was one of the most popular home computers in Europe at the time. 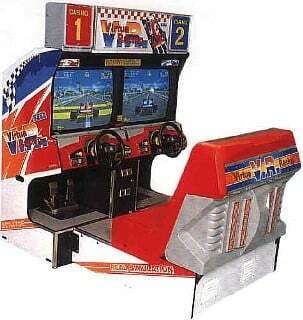 In 1992 amusement arcades saw the release of Virtua Racing by SEGA. Just like Hard Drivin' and Race Drivin' it used solid polygons rather than progressive sprite technology to create the gaming environment. The leap forward in technology now allowed for richer visuals, more complex structures and a greater amount of polygons could be shifted around the screen simultaneously. 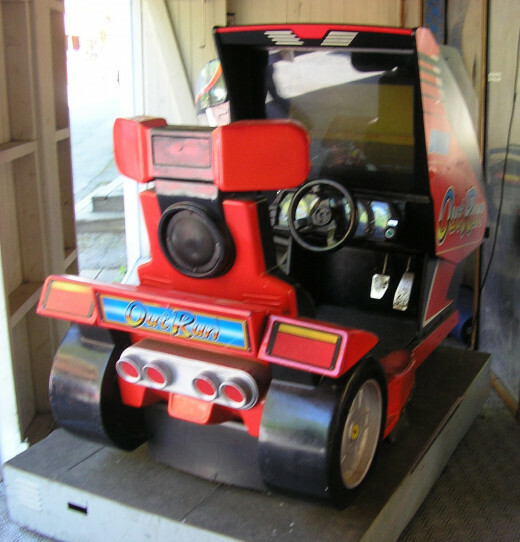 The game could be played by one or two players and featured force-feedback in the steering wheel which added to the realism. 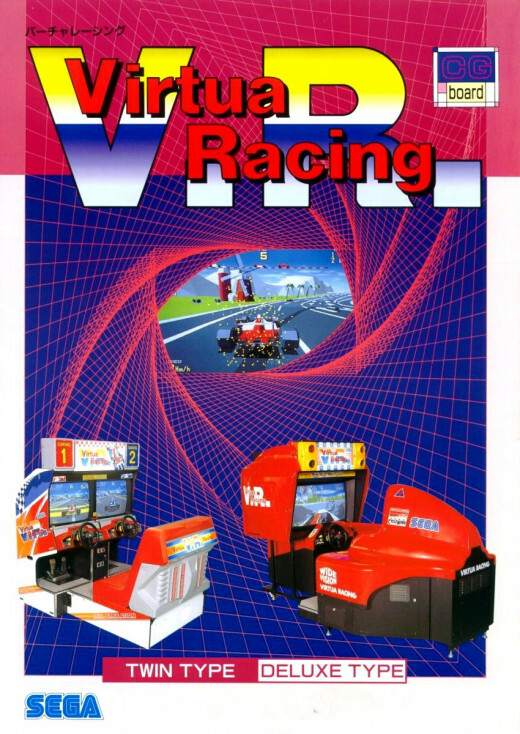 With four separate views to play the game from, accurate physics and three tracks to try your skill at Virtua Racing proved to be yet another winner for arcade giants SEGA. By 1992 the star of the amusement arcade had dimmed ever so slightly as home computers and consoles began to lessen the gap between the two technologies. This did not stop this game from being yet another big hit for SEGA though and maintained their reputation as one of the world leaders in gaming entertainment. Twin units are rare these days as they tended to break down after a few years of rigorous use. Consequently they are worth a small fortune if they are in good condition and working order. Rolling Thunder Arcade Game by Namco. Released in 1986. Any Favourite Arcade Driving Games?